PARADISE, Calif. - As the Camp Fire raged across the fields and forests of Butte County, Deborah Damonte sat on her home's tiled roof and watched the flames begin to burn along the edges of her property. 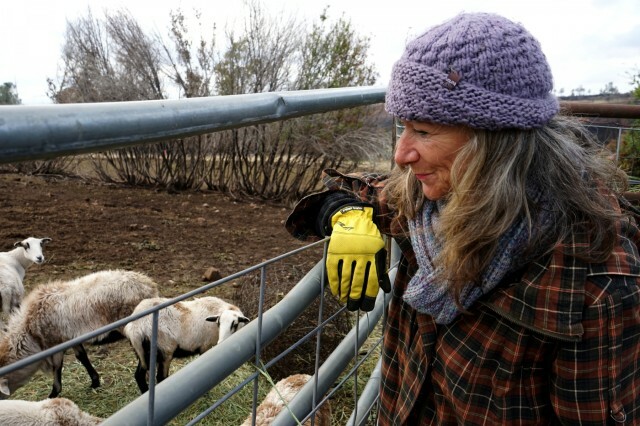 She and her husband hadn't been able to evacuate in time, so they remained on their ranch, watching the fire sweep across the landscape and turn the skies black with ash. "The power line came down across the road, and we couldn't leave, so we stayed," Damonte said. "It was scary when I saw the house across the road go up. You could see in the distance the fire going all around our property." "Our house remained, but everything else burned," Damonite said. "When we rebuilt, it was pretty fireproof." Megan Brown also stayed on her ranch when the evacuation order came. 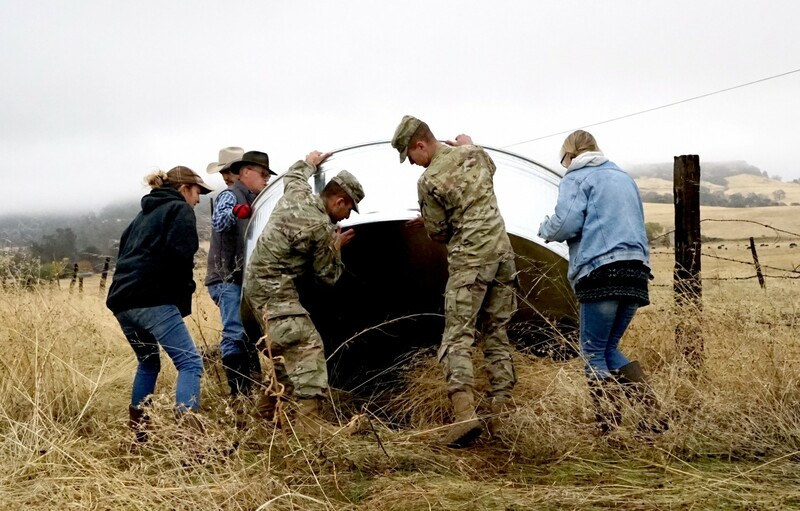 A sixth generation rancher, Brown was ready with a plan, including a mapped out sequence of locations she could escape to if the flames came too close. Brown was afraid that if she left, she wouldn't be able to get back to her animals - 60 cows and their calves, and about 40 of her prized pigs. "If they don't get fed, things could get ugly," Brown said. David Johnson, with the USDA Wildlife services in Shasta County, said Brown and Damonte's stories are common. Johnson knows the residents of this area. 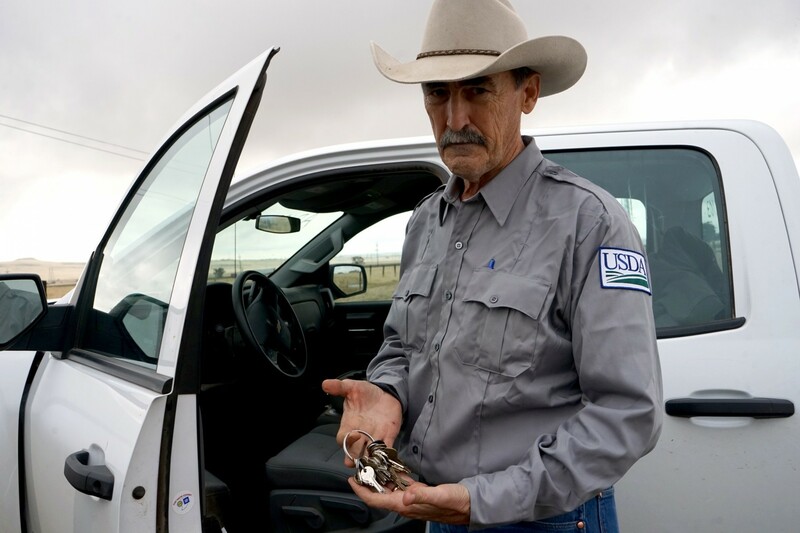 He carries a ring filled with dozens of keys, each belonging to ranchers who trust him with their homes. "They trust us to come in when they're not there," Johnson said. "It's a high compliment, and a great responsibility." "These folks won't leave their animals," Johnson said. "They're family members, and they won't leave them." Damonte and Brown were both lucky. 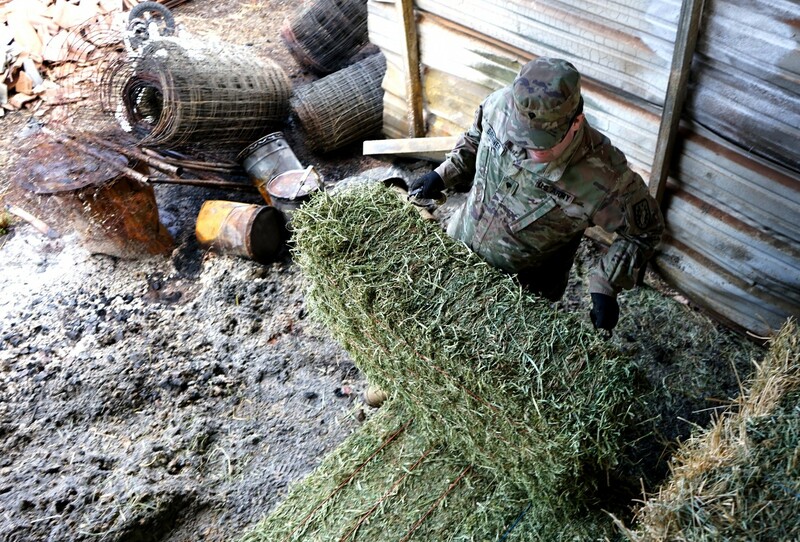 While the fire torched the areas around them, they and their animals were safe. Damonte watched from her roof as five tons of hay turned to ash just steps from her door. The fires also destroyed the flumes which delivered water to Brown's ranch. With roads closed and resources limited, the lack of food and water meant their animals were still at risk. While their property was out of danger, they now faced a whole new set of challenges - how to feed and water their animals while the surrounding infrastructure was still destroyed. After 23 days on the go, with non-stop phone calls and interviews, Lisa Almaguer was ready to be with her family. Almaguer, the Public Information Officer for Butte County Public Health and Animal Control, had been working 16-hour days since the incident began. It didn't leave her a lot of time to get home. "The other day, my kids were fighting over who got to stand next to me," she said. That's where animal rescue experts like Willmer Dyslin comes in. 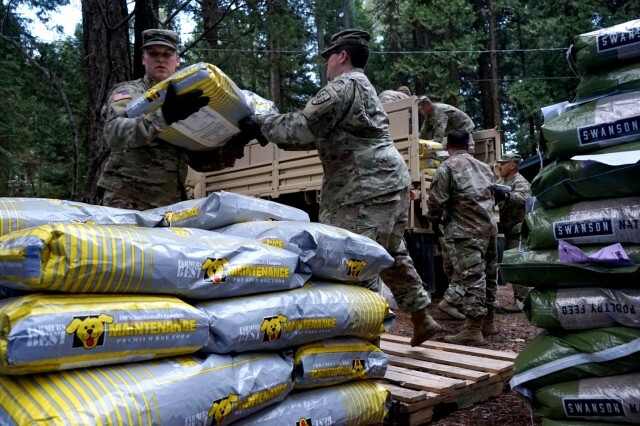 Dyslin, an Army veteran and former NVDAG volunteer, has a history of working these kinds of events, going into flood and fire zones to get things moving smoothly. 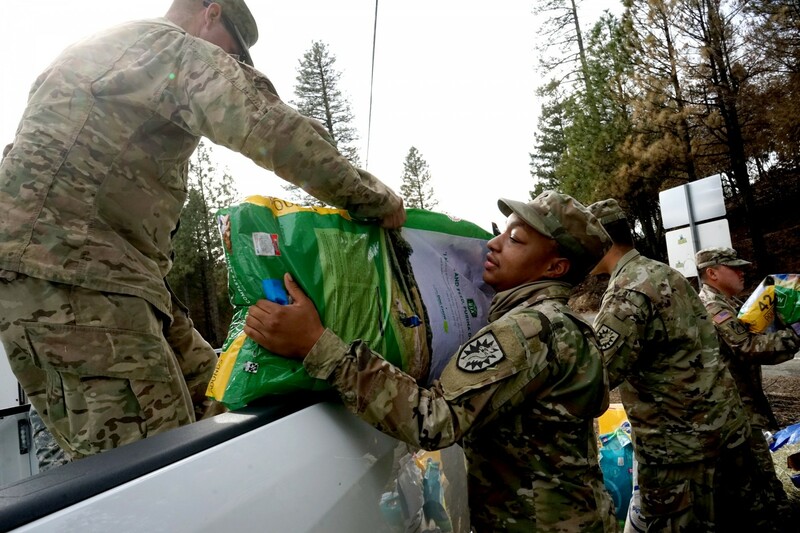 He took a role as a warehouse manager during the Camp Fire response, but said he offers a broad range of skills. "The know they can call me," Dyslin said. "They call me in to fix stuff, and I get it fixed." "Our field teams are being supported by National agencies who have experience in major disasters," she said. "The animals are safe, and being cared for." "It's pretty rare, something of this magnitude," Milsaps said. "And we have a unique organization that can work together to respond effectively." 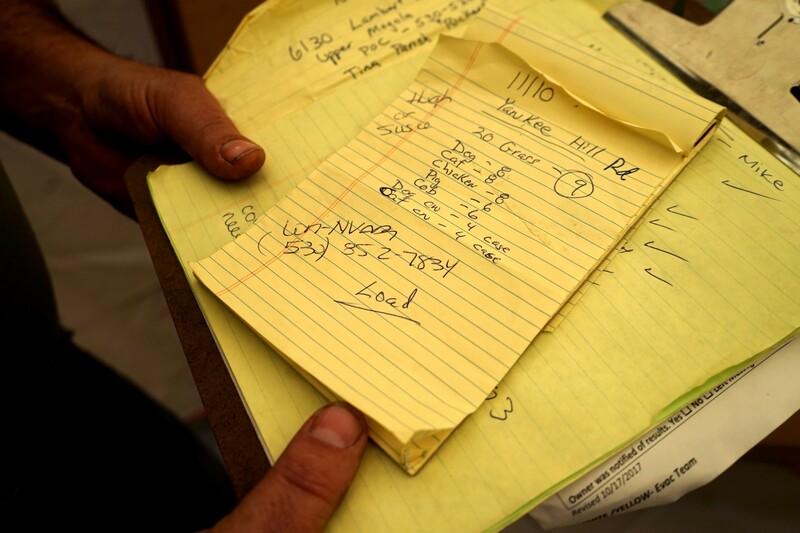 Though the warehouse had previously been pushing out 20 tons, Dyslin said operations had slowed down, and he'd only been able to send 9 tons the Sunday after Thanksgiving. He had the resources to send out, but it was tough to get tons of hay miles across the mountain in the bed of a pick up trucks. "There was no way we could keep up. First day the guys were here, they moved 90 tons like that," he said, snapping his fingers together. 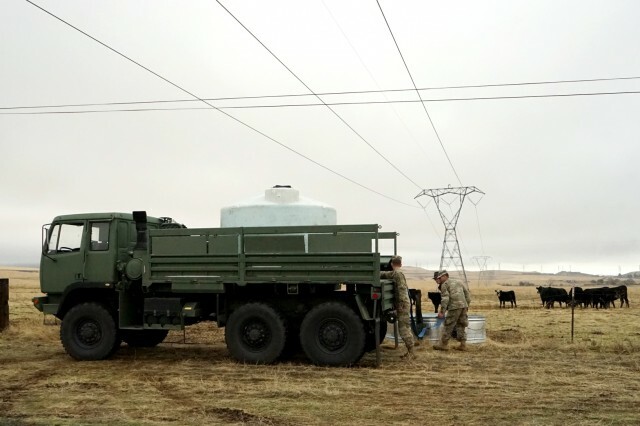 "They brought 200 gallons of water at a time. They took the deuce and a half (M35 cargo truck), and it was incredible. 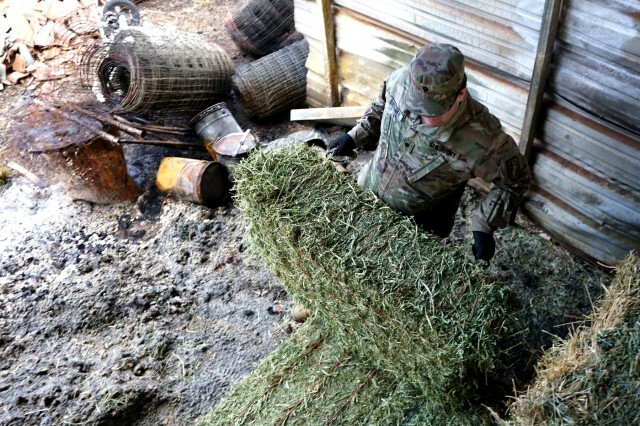 They got 30 bales to someone who had 100 goats." "It's been a pleasure to watch the morale," Johnson said. "When you show up, the people, they realize this can happen. I see them smile for the first time." Hauling pet food and bucking hay isn't the kind of work the Transportation Company is used to. 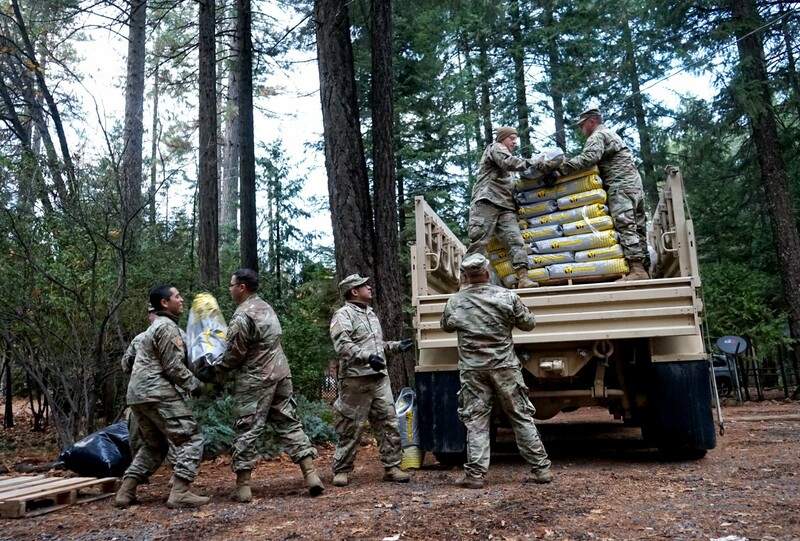 "Normally our mission is transporting infantry and personnel," said Sgt. 1st Class Jeffrey M. Hawley, Operations NCO and truck master for the 2632nd. "This is something we never thought we'd be doing, but we're doing it." 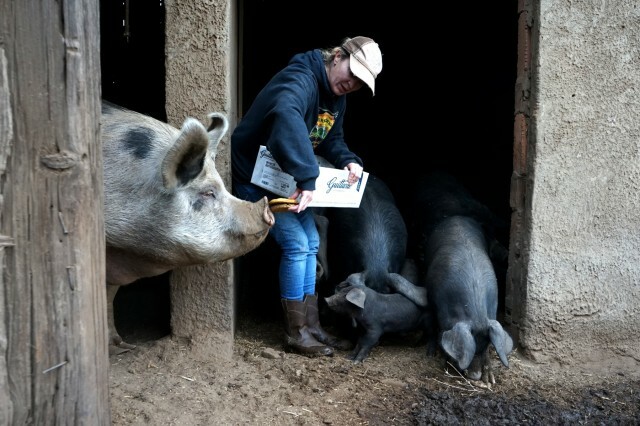 "We think about the human impact, not just their livelihood," said Hawley. "It's a good experience, to understand the broad perspective." Platoon Leader 2nd Lt. Mackenzie Q. Foss moved to California just a few months ago from South Dakota. 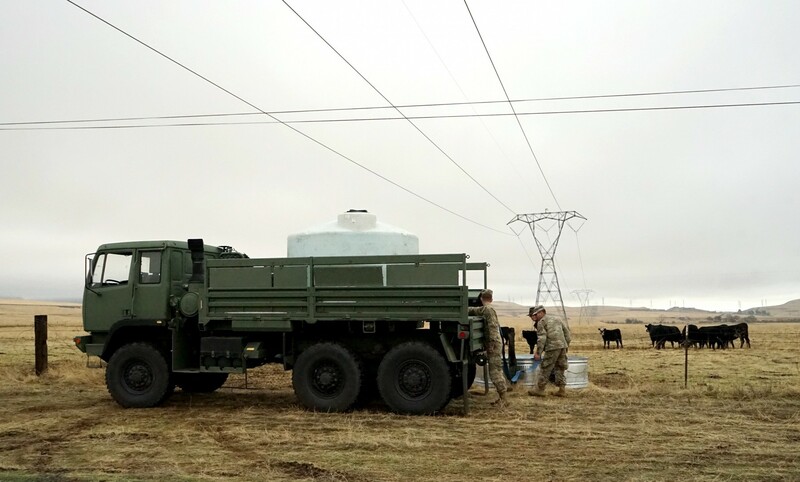 New to the company and the state, Foss had never been mobilized for a emergency active duty before. She said she's been moved by the experience. 'It just breaks my heart - just seeing the area, the number of people it has affected," she said. "It's really eye opening to see the way the community pulls together. 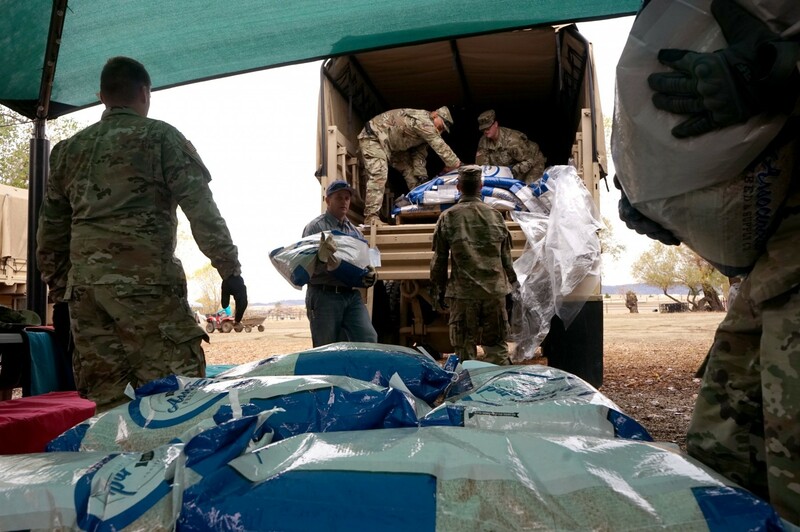 We're working with civilians and combined forces to help any way we can." "We've got an awesome team," he said. "We have a lot of senior NCOs who did this work on deployment. Our leadership is unfolding to our junior Soldiers, who are out here learning a lot." Spc. Miguel Costa, a truck driver, said it was a rewarding experience. He's been with the unit since 2015, and has gone out on fire missions before, but he hasn't worked on an operation quite like this. "It's good to see civilians helping, and law enforcement," Costa said. 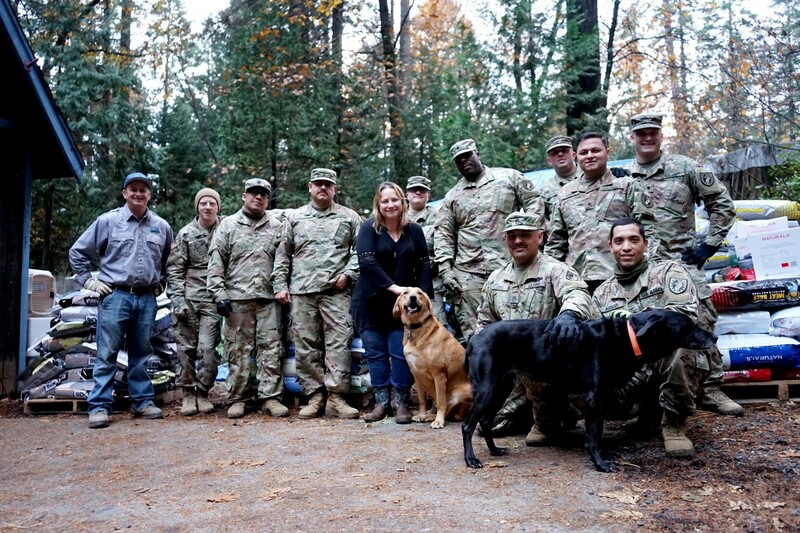 "It's great to see a joint task force, and everyone participating. It's good to see the community itself coming out." Costa said he wasn't surprised by how quickly the coordinated effort came together. "My team is on it," he said. "No matter if it's last minute, we always get rolling right on the spot." 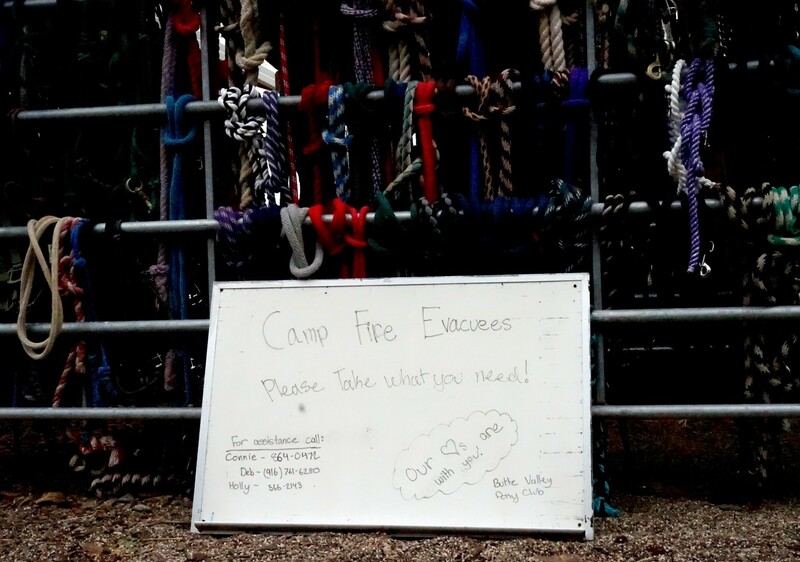 As soon as the evacuation order came in, Tina Rickert was ready to move. 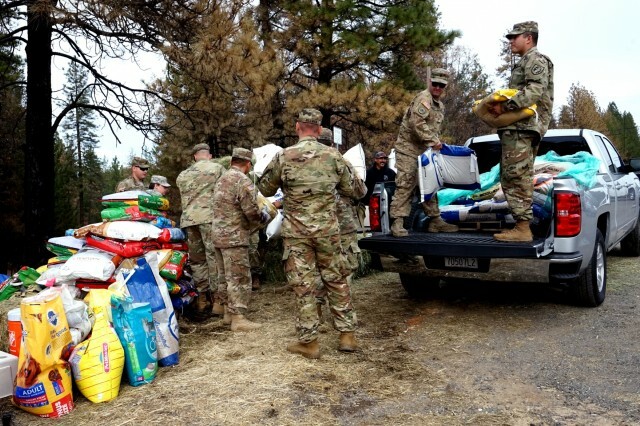 She loaded her truck with her family and her two rescue dogs, and headed out of town. But first, she stopped at her elderly neighbor's house to check on him. "We pounded on the door until he answered," she said. "We told him we have to go right NOW. He had no idea. He hadn't even heard it." "We all made it down together," Rickert said. After two weeks in the heart of the fire zone, the smoke exposure started to affect her, hurting her throat and lungs. She knew she needed to take care of herself, but felt she just couldn't walk away. Dyslin understood her reluctance to leave, and he had an idea how she could take care of her health and still be part of the action. Rickert's home was only a few minutes outside the evacuation zone, and easily accessible to residents both in and outside the evacuation zone. "I was talking to Will, and he said, 'If you really want to help, what about putting a feed store at your house?'" Rickert said. "I didn't want to come home at all, but this was a way to keep serving the community." Only a few hours after the 2632nd started work, they had already made their second drop to Rickert's house, successfully converting it to a feed center. 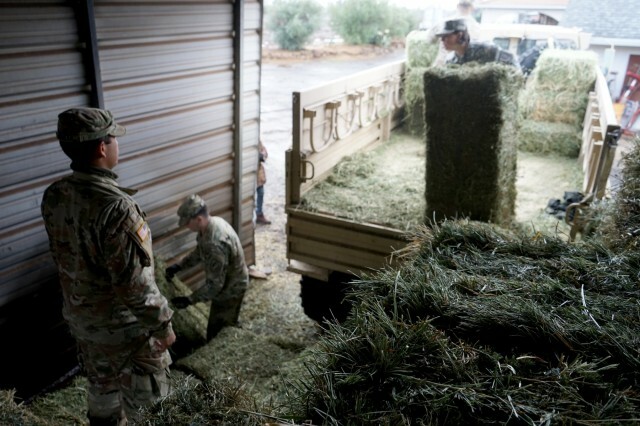 As the day dimmed into twilight, the Soldiers filled Rickert's garage with pet food and kitty litter, and loaded bales of hay onto pallets. Before the sun set, Rickert would have nearly five tons of supplies stacked neatly, waiting for anyone in need. On Brown's ranch, the cattle troughs were empty. Even though storms threatened to flood the area, there was little standing water for them to drink, and more cattle were on the way. 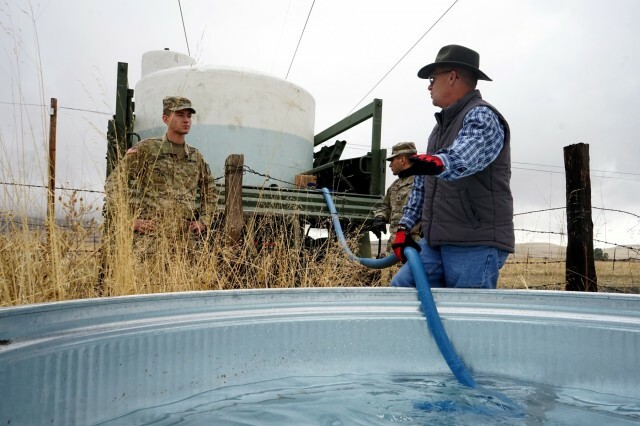 When the Soldiers arrived with water tanks, Brown was overwhelmed. "They just pulled up and it was magical," Brown said. "They are saving our lives right now. This means so much to me and to the community." "Do you see that?" Brown asked, her voice cracking with emotion. "That's life changing. A little thing like that...I'm gonna cry." 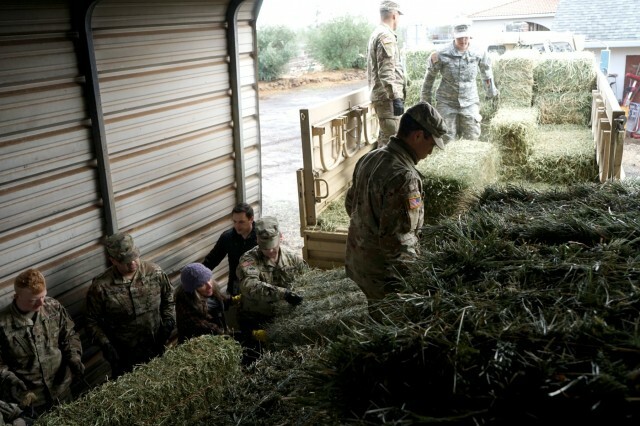 At Criswell Ranch, Deborah Damonte gave the Soldiers an impromptu lesson in basic farm skills. Damonte expertly stabbed a bale with two hooks, and showed the guardsmen how to properly carry and stack the hay they'd loaded into their trucks that morning. 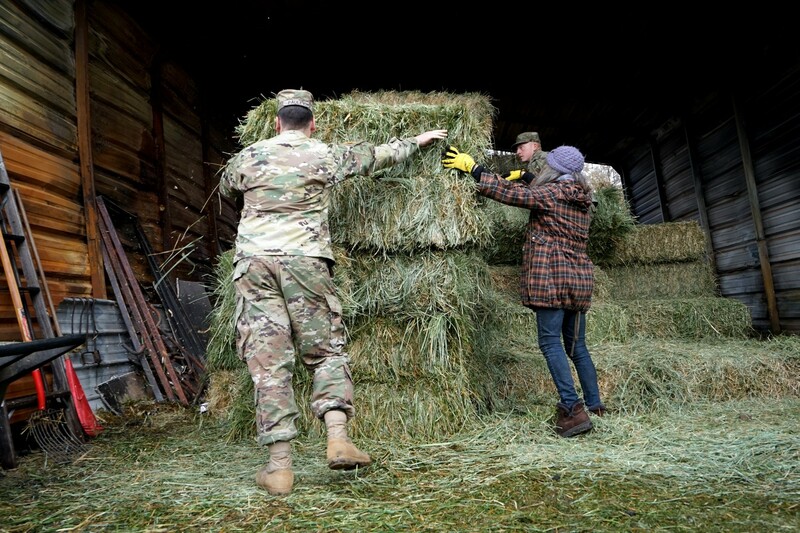 "That's called bucking hay," she told the Soldiers, her face breaking into a smile. 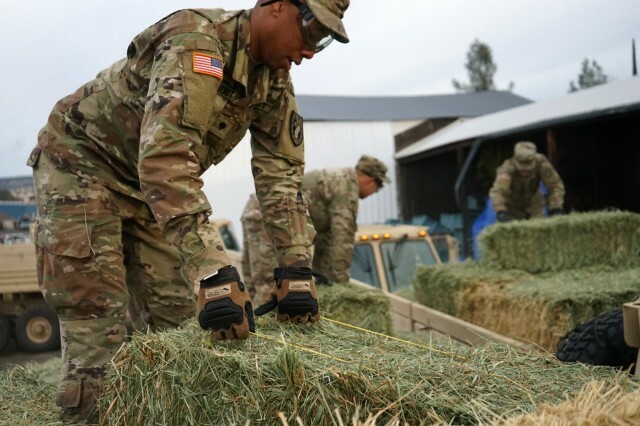 "It's hard to get down and pick everything up when you're going through 5 bales of hay a day," Damonte said. "It's great that they're here providing this service." 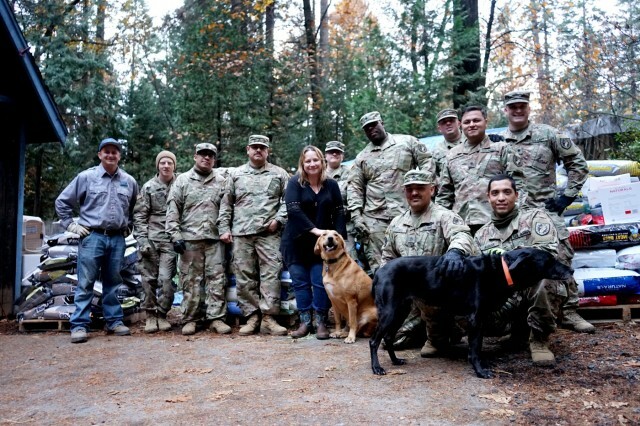 Seeing their impact on the community has been meaningful for the Soldiers. At each location they've visited, residents tell them the work they are doing is changing lives. "As the teams are going in, the people are grateful," Hawley said. "We get a lot of positive feedback from the people affected." "These guys are A#1 in my book" he said. 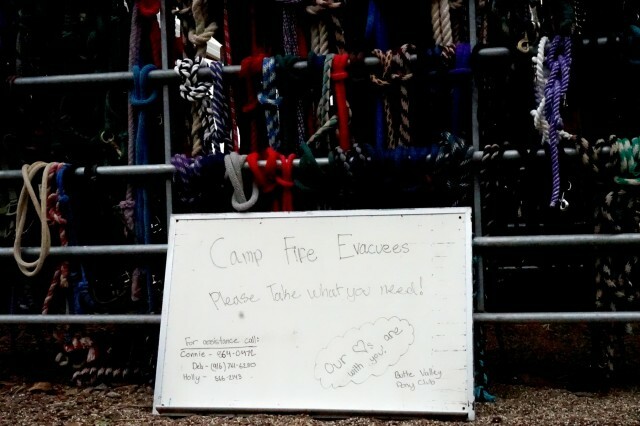 "These people need help, and these guys are providing it." 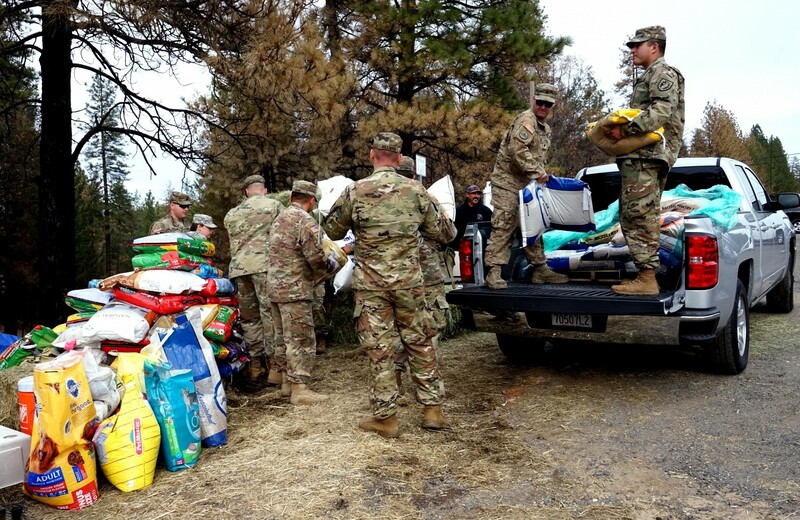 As the Soldiers unloaded the last of the supplies at Tina Rickert's house, she opened the gate to let her dogs run out to greet them. The dogs, Bella and Buddy, wiggled excitedly. Rickert wanted to get a picture with everyone before they left. 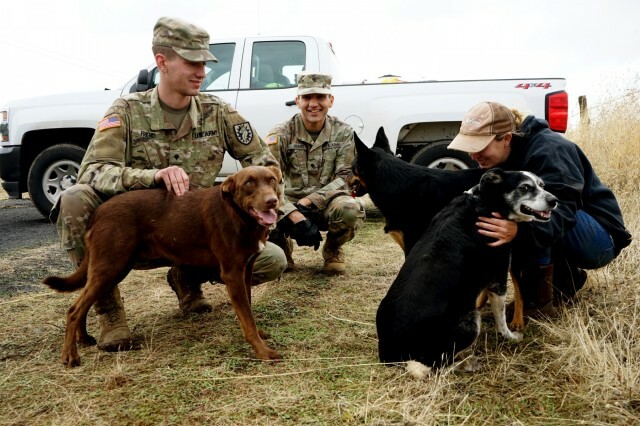 "I miss my military family," she said, smiling as the Soldiers bent down to play with the dogs. After she and her family evacuated, they learned that Rickert's mother's home, the first house she had ever purchased, burned in the fires. She had moved to Magalia only months before. While Rickert's home was spared, she lost her business, a soap company with products in stores across the mountain. "When all of this happened, I thought, I have so many skills I could put to use in my community," she said. "So, I'm working on that." 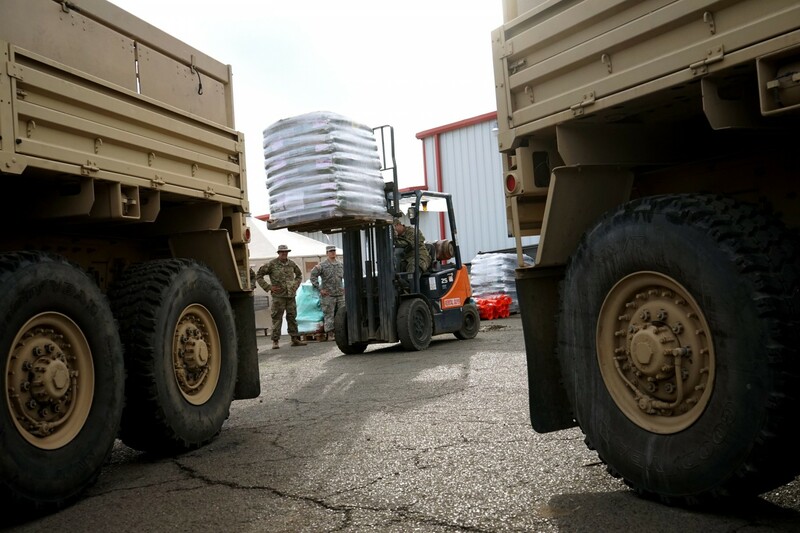 She paused, watching the Soldiers unloading the last of the donated supplies. "So many people are working to make it a better place." "Don't lose hope," she said, wiping her eyes. "As a community, it's all we have." "I love Paradise," she said. "It will be back. It will be Paradise again."